Pushkin was the first writer to create a literary myth of Saint Petersburg, which he did with his poem "The Bronze Horseman", named after the great bronze statue of a mounted Peter the Great. Pushrin describes the great flood of 1824- one of many cataclysmic floods in the city's history. In the poem, St.Petersburg is a mystical city, a masterpiece of the human mind and a challenge to the elemantal forces of nature. The poem's prologue is a tribute to St. Petersburg. Pushkin's literary heritage is enornous and has been a source of inspiration for artists in all genres ever since being written. All of the great figures of Russian musical composition drew on Pushkin's works- poetry,prose and drama. Tchaikovsky,for example, turned no fewer than three of Pushkin's works-"Yevgeny Onegin", "Mazeppa" and "The Queen of Spades"(Pikovaya dama)-into operas. Other composers who wrote operas based on Pushkin were Musorgsky ("Boris Godunov"), Glinka("Ruslan and Ludmila"),Rachmaninov("Aleko"), Rimsky-Korsakov("The Golden Cockerel"; Zolotoi petushok). Many composers also turned Pushkin's lyric poems into songs. Some of the best known of these include "I remember a magical instant" (Glinka; poem dedicated to Anna Kern), "Don't sing, beauty in my presence" (Rachmaninov), "On the hills of Georgia" (Rachmaninov, Cui, Rimsky-Korsakov) and "Vertograd" (Dargomyzhsky). A poet of genius, Pushkin is known not only for his literary output, but also for his colouful life. Pushkin was born in Moscow on June 6, 1799 into an old noble family that could trace it's roots back to the 13th century and was bound up with the history of the Russian state. The young Pushkin developed a passion for literature from his childhood. Pushkin had a Russian nurse, peasant woman who told Pushkin fairy tales, sang him folk songs and was a fountain of proverbs and sayings. Another great influence on the poet's development was the Lyceum that he attended from 1811 to 1817. This elite educational institution was opened by a decree of Alexander I in the part of the palace in Tsarskoe Selo, not far from St.Peterburg. 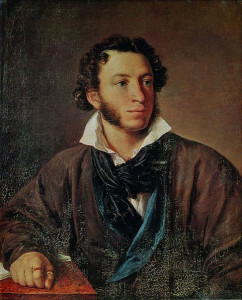 After graduating from the Lyceum, Pushkin was given a nominal appointment in the Foreign Ministry, but instead of working in the service of the State, he was exiting St. Peterburg society with his revolutionary verses. Alexander Pushkin spent two years in exile by order of the tsar at his mother's estate Mikhailovskoe, in Pskov. It was there that he continued writing "Eugene Onegin"(a work that took him many years). While at Mikhailovskoe he also wrote "Boris Godunov", which is based on events of that period. Mikhailovskoe is a state museum now where Pushkin wrote some of his masterpieces. Six years of exile for Pushkin ended in autumn 1826, when a new monarch, Nicholas I, came to the throne. Despite the lessons of his exile and enduring his days under surveillance, Pushkin didn't stop singing hymns to freedom. Pushkin perhaps had a need to fall in love; love being necessory food for his inspiration and the source of his creative energy. The list of Pushkin's love is long-about 113 prior to getting married. Pushkin married Natalia Goncharova in 1831 and in October moved to St. Petersburg. On the 27th of January in 1837 Pushkin was mortally wounded in a duel with d'Anthes over Mme.Pushkin's honour. Alexander Pushkin is buried beside his mother near Mikhailovskoe. Dostoevsky was born on 30th October, 1821 in Moscow. His father, Mikhail Dostoevsky, was a doctor at the Marinsky Hospital for the poor in Moscow. When Fyodor's mother died, his father, left with seven children on his hands, decided to send his oldest sons to the vocational Military Engineering Academy in Peterburg, 'in order to garantee their future'. After one year in Academy of Military Engineers he left the department and devoted himself to writing. Ahead lay a new city, an unwanted course of study, and a life of wandering. Starting in May 1837, Dostoevsky's fate was forever connected with Peterburg. It was the city of his young adulthood, of his birth as a writer, of dizzying successes, tragic experiences and lossses. All in all, Dostoevsky lived in Peterburg for twenty eight years. In 1846 he published his first novel 'Poor Folk'. It was a great success,and suddenly Dostoevsky was famous. In 1849 Fyodor joined a secret political group which was against the current political system in Russia and for freeng serfs. He was arrested and convicted to political offences. The prisoners were sentenced to four years of hard labour in a prisom camp in Siberia. Dostoevsky's experiences in the prison tortured him. He describes his feelings from this in the novel 'House of Dead'. Only in 1859 he was allowed to return to St.Petersburg. In the next years he wrote his most impressive and famous novels: 'Crime and Punishment', 'The Idiot', 'The Possessed' and 'The Brothers Karamazov'. Dostoevsky had a lot of financial problems. So in the 1860th he moved to Western Europe. A publisher there offered him a lot of money to write a novel.Dostoevsky hired an assistant, Anna Snitkina, to help him as she knew shorthand. After six months later, he married Anna. Oner the years, they had four children. Anna took care of his business and worked with his publishers and the people he owed money. 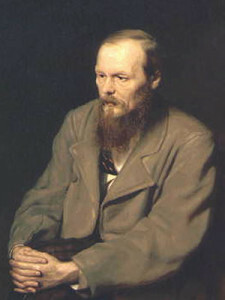 Dostoevsky died at the age of 59. Thirty thousand people watched his coffin pass through the streets of St.Peterburg. After his death, Anna Grigoryevna Snitkina devoted the rest of her life to cherishing her husband's book. When Fyodor Dostoevsky died he was Russia's greatest writer. And now he is considered one of the greatest writers in the world.